GoCo is an integrated human resources management, benefits, and payroll platform all rolled into a single, unified solution. 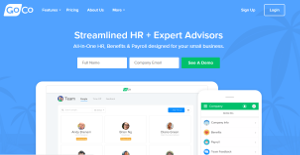 The software is specifically built for small and medium-sized enterprises aimed to help streamline their HR processes, including hiring, onboarding, and more. GoCo provides busineses with a platform that enables them to implement 100% online benefit management with the backing and support of expert benefit advisors across the country. Managing and performing payroll tasks is a breeze with GoCo. Integrations with the leading payroll applications allow you to keep your existing payroll providers. With GoCo, you company remains in compliance with industry standards and regulations. Your organization is kept updated on the latest employment and benefit compliance laws automatically. GoCo delivers a modern human resources management platform that enables you to automate your HR workflows. The software lets you customize the whole enboarding journey and gathers I-9s, W-4s, agreements, work eligibility info and more from newly hired employees. Your workers will definitely appreciate GoCo’s employee portal where they can request and monitor time-off from the personal accounts. This self-service feature helps you and your employees save time, time they can channel on other tasks and functions and increase productivity. With GoCo, you have a clear view of the big picture, from headcount, benefit cost, compensation, and other reports, allowing you to gain better, high-value insight into your organization. The software generates custom reports that show information that you need in the most comprehensible manner. The software centralizes all information, documents, and benefits in a singular, unified location that you can easily access anytime. Everything is organized for fast and easy navigation. Security is also topnotch, as GoCo uses bank-level encryption to protect data from unauthorized access and undesirable parties. Seamless integrations with other systems simplifies data entry. Any changes you made on GoCo is automatically synced to your other business applications, including your payroll software and other business apps like Google Suite. Best of all, GoCo is 100% free. What Problems Will GoCo Solve? Problem: Employment Paperwork is time consuming, tedious & frustrating. How GoCo solves it: GoCo streamlines all HR workflows completely paperless. From offer letters, I9, W4, Confidentiality Agreements, to selection of benefits and filing with the insurance carriers, GoCo makes it simple and easy. Problem: Companies currently have many disjointed systems that don’t talk to one another. How GoCo solves it: GoCo centralizes all Employee records and documents and seamlessly syncs with payroll and employee benefit carriers. Data flows automatically and HR admin can manage it all from one place. Problem: Compliance Laws are increasingly complex and constantly changing. How GoCo solves it: GoCo has built in compliance rules to keep you in check and enables you to easily keep all your ducks in a row and reduce liability. If you are considering GoCo it may also be sensible to examine other subcategories of Best HR Software listed in our base of B2B software reviews. It is crucial to realize that almost no app in the HR Software category will be an ideal solution able to fulfill all the requirements of all company types, sizes and industries. It may be a good idea to read a few GoCo reviews first as some solutions might excel exclusively in a really small group of applications or be prepared with a really specific type of industry in mind. Others can operate with an idea of being simple and intuitive and as a result lack complex elements desired by more experienced users. You can also come across solutions that focus on a wide group of customers and provide a complex feature set, but this frequently comes at a more significant price of such a solution. Ensure you're aware of your needs so that you buy a solution that has all the features you search for. How Much Does GoCo Cost? We realize that when you make a decision to buy HR Software it’s important not only to see how experts evaluate it in their reviews, but also to find out if the real people and companies that buy it are actually satisfied with the product. That’s why we’ve created our behavior-based Customer Satisfaction Algorithm™ that gathers customer reviews, comments and GoCo reviews across a wide range of social media sites. The data is then presented in an easy to digest form showing how many people had positive and negative experience with GoCo. With that information at hand you should be equipped to make an informed buying decision that you won’t regret. What are GoCo pricing details? What integrations are available for GoCo? If you need more information about GoCo or you simply have a question let us know what you need and we’ll forward your request directly to the vendor.